BBA program is a cherished management program. However, there are many variations in the BBA degree and I will explain you about these in this article. 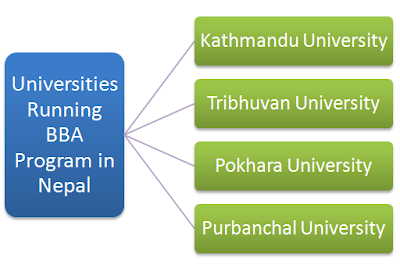 In Nepal, there are mainly four universities which provide BBA degree to students. These universities run their programs both through their own campuses as well as other affiliated colleges. In this post, I am going to evaluate the BBA degree of each of the different universities so as to help you decide which university to choose or recommend to your friends or juniors. All the BBA programs are run on semester system, which means that you'll have to appear board exams in every six month during the program. The BBA of Kathmandu University is recognized to be one of the best and well-managed programs. KU provides BBA degree through its affiliated colleges like Kathmandu College of Management, Little Angel's College of Management and Nepal College of Management; as well as its constituent campus, Kathmandu University School of Management. You can learn more about it here. The BBA of Purbanchal University is the one I would least recommend. The main demerit of the BBA of Purbanchal University is that its exams aren't held timely. In the semester system education, nothing is more painful than the delay of examination. You already have to study four years for a bachelor level. And if time goes beyond this limit, it will be really nauseating. Even on the curriculum front, other universities are ahead of it. So, I don't recommend you to register for the BBA of Purbanchal University. What is worse that its website has expired and I can't provide you the link to learn more about its BBA program. In short, it is not the university that is going to study for you. It is the job of students themselves to study well. However, if the university doesn't regulate its examinations well and updates its curriculum regularly to reflect the latest developments in different subjects then the student's effort will either be useless or will go in the wrong direction. Therefore, it's vital to select good university even if you aren't planning to study well. Now, if you have enough money I would recommend you the BBA of Kathmandu University. If you can't go there, I would recommend good private colleges which run TU's or PU's BBA program. Since, education is a onetime investment which provides a lifetime return, I recommend you to study in good colleges, which teach you skills, by paying higher fees rather than to study in a bad college by paying a small fee. If you get a cheap college which provides quality education, then consider yourself lucky!